Several generations of girls enjoyed the sleuthing adventures of the fictional Nancy Drew, but did you know that the author of the first Nancy Drew book lived and worked in Toledo, Ohio? 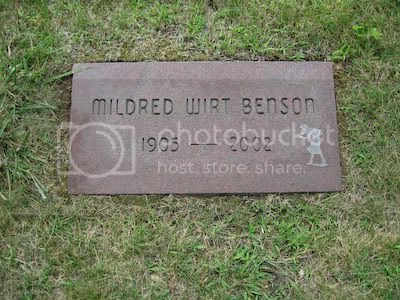 Finding the final resting place of the author, Mildred Wirt Benson, took just a little sleuthing of our own while participating in the high-tech treasure hunt known as geocaching. Finding out-of-the way places off of the beaten tourist path is one of the things I like most about travel, and geocaching is like having access to knowledgeable local guides at nearly any destination you visit. Geocaching even helps us find interesting places near home. One of our more interesting finds was a cache in a local cemetery memorializing the efforts of a group of African-American “Buffalo Soldiers” who served during the Spanish American War. We learned a bit about the courage these men displayed, and the hardships they endured, as we read the cache description and made the find by visiting their graves. The Nancy Drew and Buffalo Soldier caches are just two of more than 650,000 caches hidden around the world and registered at www.geocaching.com, and some of the nearly 200 caches finds we’ve logged since taking up geocaching early last year. Geocaching is similar to letterboxing, which uses clues hidden in stories to lead seekers to hidden caches. Geocaching is basically a treasure hunt where cachers use computers and Global Positioning Units (GPS) to find caches hidden by fellow hobbyists. Letterboxing is more than a century old. Geocaching, because geographic coordinates and modern technology lead players to caches, is a 21st century hobby with the first geocache coming into play during the year 2000. I thought geocaching sounded like fun after reading several articles about the hobby. When Tim mentioned buying a GPS as we planned a road trip out West, we decided to buy it and try finding our first cache. We quickly located an ammo box hidden in a local nature center, logged our first find and became hooked on the hobby. Caches take many forms. Some caches are waterproof containers like ammo boxes purchased at a military surplus store and filled with small, inexpensive trinkets. Other caches take the more challenging form of small magnetic boxes or containers barely larger than an eraser on top of a pencil. Some caches have no physical form at all, instead leading players to a specific location where they need to answer questions about the place before receiving credit for the find. Geocachers also take many forms, with the hobby drawing a variety of players that include couples, families, retired folks and school or Scout groups. Some players enjoy solo caching. I cache as part of a two-person team and find most cachers I’ve met cache as teams or families. 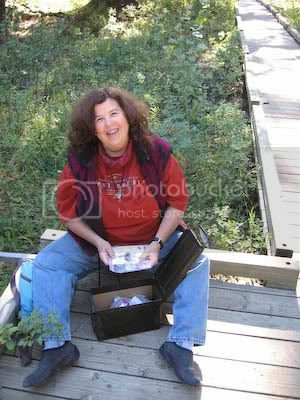 The hobby is family-friendly, and I’ve seen a lot of kids on the cache trail and at caching events. Even as caching nears just its first decade in existence, the geocaching network includes many local organizations, like our local southeast Michigan group. Meeting other cachers at local events like picnics, dinners or camping weekends is just another aspect of the hobby’s fun. Want to do some sleuthing of your own? Some resorts or outdoor outfitters offer rental GPS units for those who want to try the hobby before making an investment in equipment. We’re happy with the Garmin 60CSx GPS we purchased at REI. Garmin and other companies sell units to fit various needs and budgets, and we found it helpful to consult the staff and look at various units at our local REI. I loved Nancy Drew! And I just got completely distracted reading about geocaching. What a fun hobby! It looks like there are two caches within a mile of me. Love the Nancy Drew angle here; I read every single one in that series as a girl--more than once. Thanks for the recap of geocaching; we're excited to get started as a family!